When it comes to digital innovation, Airtel Zambia continues to lead the way as a pioneering telecommunications service provider in Zambia. In order to convert their progressive approach to digital communications into a physical retail store, the company called upon the retail design expertise of AB Design to help develop its flagship store in Zambia in 2016..
A contemporary open plan space was conceptualised to offer function and style. AB Design stepped up to the challenge to design and implement a sleek, sophisticated and futuristic store. From concept to installation, the overall retail store design would need to communicate the organisational ideals of Airtel Zambia and translate its well-articulated brand guide into a tangible retail space that would grow to become the face of the company in Zambia. After an 8-week in-depth design process, AB Design set off to materialise the new retail design of the store. “By far the biggest challenge was the fact that Airtel had no existing stores in Zambia so there was minimal direction to go on for the design of what was to be the flagship store,” explains owner and creative director of AB Design, Aidan Bennetts. 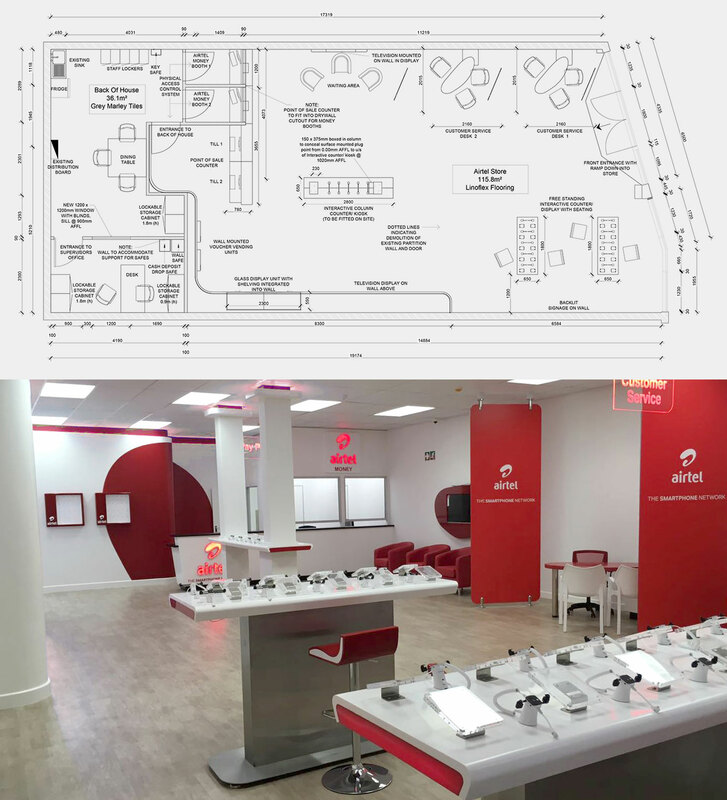 Thankfully, due to the extensive retail store design expertise of AB Design, the team were able to conceptualise an innovative space to bring the Airtel philosophy to life. The overall layout serves the company’s operational goals. “The design needed to be progressive in its approach,” explains Aidan Bennetts. The layout therefore needed to be dynamic yet highly operational. “There had to be a definite divide between the service offering (cell phone contracts, Airtel money etc.) and product offering (handsets and other devices),” he explains. 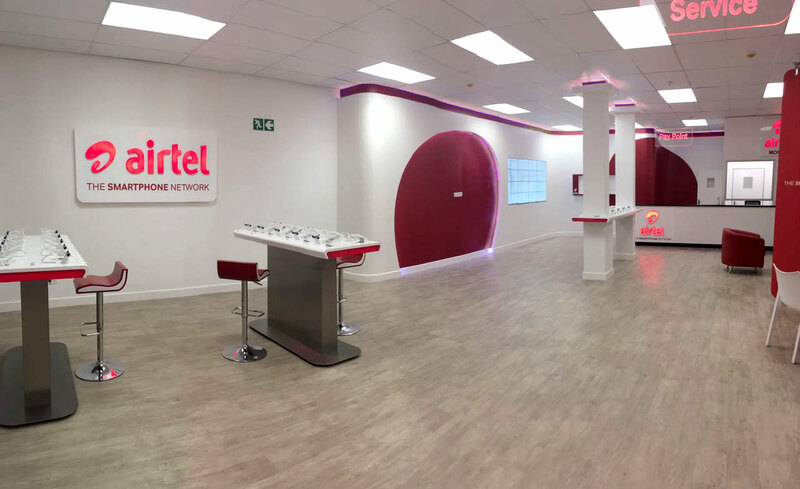 Key areas were therefore conceptualised to include a waiting area, customer service desks and interactive counters with kiosks – all functionally available to service Airtel’s unique clientele instore. Function, flow and aesthetics work together to achieve a streamlined, connected space. Modern and streamlined, the store boasts Airtel’s bold brand colours of red and white. The overall layout explores the brand’s affinity toward digital innovation and each design element aims to complement the revolutionary and modern ambience created here. Using Airtel’s distinct colour palette of bold red and white, the interior reflects the professional and forward-thinking ethos of the brand. “We restricted the use of stylistic décor to keep the aesthetic clean and modern,” adds Aidan Bennetts. Bold red signage – a clear indication of the brand’s presence within the retail store design. Versatile seating – from striking red bar stools to the use of occasional seating in strategic areas, the store’s arrangement of seating caters to a variety of retail needs. LED Lighting – unmistakeable in red, the vivid layers of lighting in this space adds to the futuristic ambience created instore. 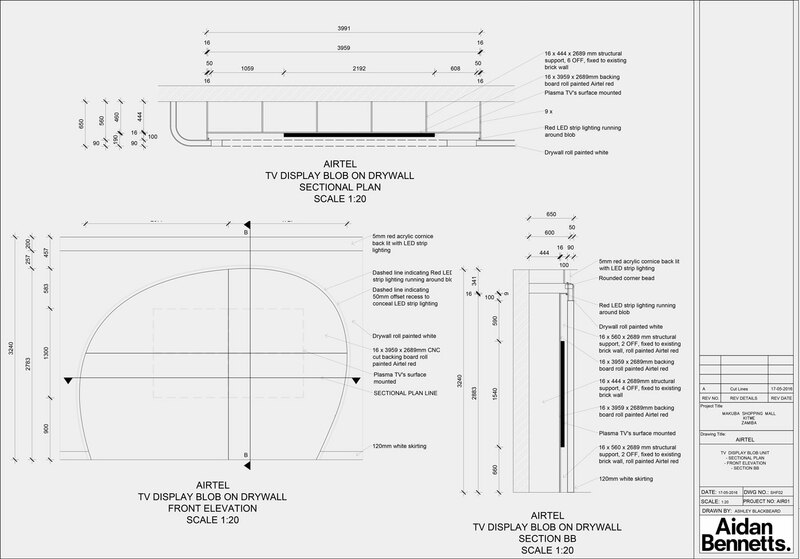 TV Display – custom joinery in complementary colours create symmetry in design. What innovative and unconventional design elements were incorporated into this retail store design? The Blob – Custom joinery adds to the dynamic ambience. Tell us about the interesting use of non-traditional materials to achieve a distinct designer look. The open plan space is designed to be interactive and engaging for clients and staff alike. Trendy yet untraditional, the store design has become a talking point; a dynamic, forward-thinking space that continues to pioneer the merger between telecommunications and retail design in a functional, futuristic space.